There have been six months in the year and, it seems, as many Marvel Cinematic Universe movies so far. The next installment, Ant-Man and the Wasp, is a sequel to the quirky, lightly humored and technologically amusing 2015 film starring Paul Rudd as the titular character/Scott Lang. How can there be another film so quickly, you may ask, after that oh-so interesting ending to Avengers: Infinity War? I am not really afraid of spoiling it. If you are reading this, surely you have seen the film - though that also means you know the answer to my rhetorical question already. If there are two things that are sacred in this Universe it is the post-credit scenes (the first here, scintillating, the second, offensively pointless), and universe continuity. To achieve that despite the ashen climax to Avengers 3, God, I mean producer Kevin Feige set this film in the time right before the events of that movie, but with a continuation of the interesting power and familial dynamics that were put on display in the first one. Lang is a lovable criminal, a playful dork turned superhero, a character who really seems like he was designed for Rudd himself. But the talented comedian, whose main contribution to the film is its nerd/bro comedic script, is clearly overshadowed in the acting department by his fellow cast mates. First and foremost is Evangeline Lilly, taking on the other titular role in the absence of her scientist mother, as well as Michael Douglas as Hank Pym, a former S.H.I.E.L.D. agent and other important scientist in this universe. Lilly plays his daughter, Hope, and together the two are determined to find the original Wasp, played in this movie by Michelle Pfeiffer. Their quest requires them to construct a subatomic particle accelerating tunnel into the “quantum realm,” which in turn takes them across the path of many friend and foe. A common problem with these adaptations is that in their fear of offending rabid fan bases, few characters are taken to the chopping block, resulting in bloated credit rolls. 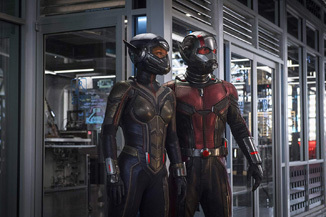 Ant-Man and the Wasp is no exception, with baddies ranging from Walton Goggins to Hannah John-Kamen as the mysterious “Ghost.” Laurence Fishburne appears as a character from Pym’s past, Michael Pena is again Lang’s criminal sidekick, and Judy Greer and Bobby Canavale play small roles as well. The oversize is ill-fitting for a film with small ambitions, though no one character takes up too much of the scenery or overstays their welcome. It is the price one pays for adapting Stan Lee’s vast and unyielding oeuvre. Most everything else is thankfully much more reduced in Ant-Man and the Wasp. The film’s ambitions are smaller, for one thing, focusing mostly on the credible family story between the two lady Wasps and Pym, with Lang really the supporting character. The Ghost’s backstory is also interesting, though it is derivative of the archetypical story of villain begotten from technology-gone-awry that characterizes so much of Stan Lee’s work. It helps that the narrative constantly interrupts itself to look at silly little jokes, some decidedly more effective than others - some truly delightful. To be sure, the film exists squarely within a very vast, very lucrative, and very-well guarded franchise. Most importantly, it cannot deviate from the formula that Disney believes sets this group of movies apart from the much less successful ones over at Warner - the peppy, light tone, the brighter colors, and parallel stories. Indeed, Ant-Man and the Wasp at times delves into the esoteric, particularly with the rich palette of the quantum world. And the effects are what you want them to be - impressive without overtaking the action, eye-grabbing without being the movie’s sole purpose. It is absolutely fair to say that Lang’s boyish charms and impossibly good heart are clichés of this world (remember, among others, Iron Man? ), that Hope’s resolute determination and no-nonsense demeanor are as well (remember Scarlet Johansson’s character). So what? It is a formula for whence you know how to solve for the value of X - do not think too hard, follow the dotted line, and you are guaranteed a good time. By the time you get to a certain set of psychedelic quantum scenes, some high stakes car chases with shrinking and expanding vehicles, you will have a smile large enough across your face to forgive whatever climatic peccadillos may be thrown your way in the final few minutes. Not even a teasing question mark about whether Ant-Man and the Wasp will be continued will throw you off course. You know that of course they will - the princess may be in another castle, but the winning formula kept you playing through to the end of this one.